The ways to grab images from screen is as simple as pausing movie at right moment and using hotkey combo for taking that screenshot. It might work but that isn’t the right ways to follow. It is always not that easy to actually catch right moment with the help of good image quality. There are some solutions available to make a GIF from YouTube video on Mac. Among the lot, you can try using some of the PRO tools, which are designed to act in your favor for sure. But even before that, you need to learn a bit more about the tool first before you end up using it. 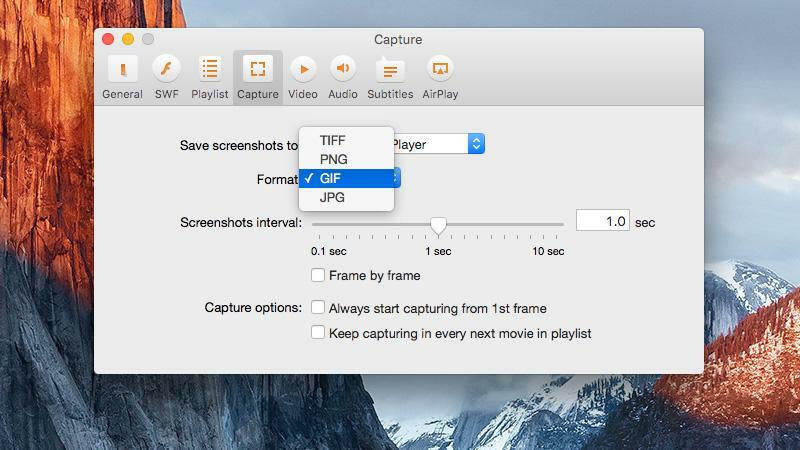 Thanks to Elmedia Player PRO version, you can now easily make snapshots of any of the movie movements in an easier way and get to produce great result as saved in GIF format in any of the folder on Mac. Before you get to convert the YouTube video in the GIF for Mac, it is mandatory to download the video to hard drive. For that, you have to download the Pro version by entering activation code as bought from developer’s website. After that, open the PRO version and switch to the browser mode. Later, paste link of the YouTube video and press Enter. Get hold of multiple file formats suggested and choose the one where you want it and click on download button. After you have the video by your side, it is time to make GIF from that portion. For that, there are few simple steps available. Start playback of downloaded video. Then open Preferences and then to Capture. Select GIF format and also interval for screenshots from 0.1 sec to 10 sec. Click on Playback option and then record series of screenshots in main menu.